As a common communication tool, cell phone, either traditional 2G or current 3G, relies on transit connection of signal tower to transmit microwave signal. Therefore, cell phone tower has become a common infrastructure facility in city or countryside. Cell phone tower is made up of signal-sending equipment, signal-receiving equipment, antenna feeder system, power supply and monitor control equipment that ensures normal operation of communication line and no maintenance. Power supply includes not only alternate current supply but also UPS backup power system to guarantee continuous work in case of power cut. Early power supply uses lead acid battery as backup power supply. Because of environmental pollution, low specific energy, large size and short lifetime of lead acid battery, lithium batteries have been used on cell phone towers under construction or upgrade as their back power supply system. Based on the above, out customer requires lithium battery pack as backup power, which could achieve 2-hour continuous work after power failure and meet the requirement of long-term outdoor work. 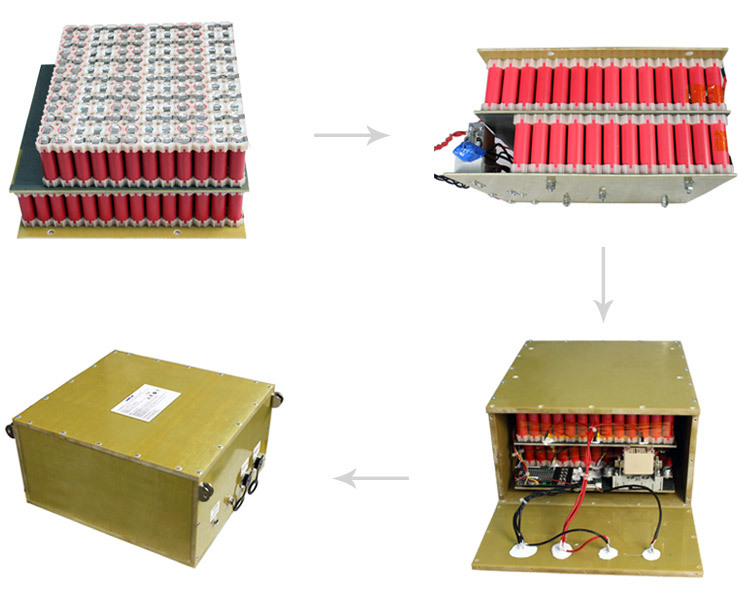 According to consumption power and conversion efficiency of the whole cell phone tower system, 48V/65Ah battery pack could attain working time required by customer. Due to high voltage, capacity and operating temperature of the battery pack, Japan imported lithium battery cells are used. These cells have high overall consistency and built-in multi protection, including anti-explosion valve and PTC. balance system between single series battery. Battery remaining capacity detect part includes detect system and display system. Detection is quite precise in current-voltage operation mode. LCD screen could display battery charge and discharge status. Battery pack parameter: as per customer’s requirement of 2-hour work time under 100W AC system, 48.1V/65Ah battery could work for 150 minutes with full load. battery temperature protection scope (recoverable): -20-60? short circuit protection on battery pack. Battery capacity monitor system function: with smart chip and LCD screen, monitor system could timely set display parameters, including battery current capacity, current capacity percentage, current battery voltage, charge current, discharge current, discharge remaining time, RSOC and ASOC. Battery overall structure design: due to wide distribution area of cell phone tower and outdoor environment, insulation, damp-proof and ageing& deterioration proof should be considered on battery. Hence, glass plate and plastic bracket could be used as case body of lithium battery pack. Secondary protection: the whole battery is equipped with protection fuse to prevent short circuit from abnormal over current. 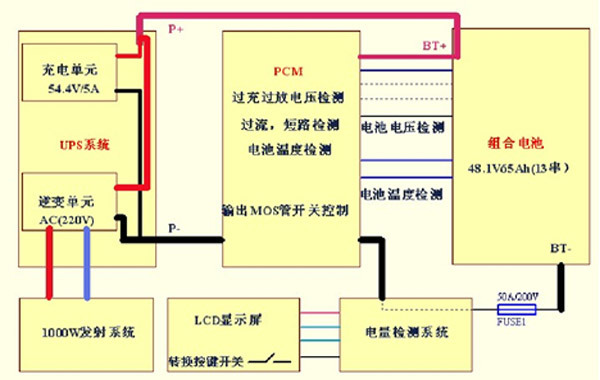 In the event of PCM system abnormity, fuse could cut off output circuit of the whole battery pack. Lithium battery cell: use Japan original imported cell, 18650 lithium battery cell /2500mAh/3.7V, which has good safety and consistency to ensure reliability of the whole battery pack.